CHTHONIC, the Taiwanese metal band recognized with its unique signature of performance, is to release an all new album Battlefields of Asura on October 10th this year since its last official album Butik (2013). Formed in 1995, CHTHONIC has hit the road of a tour over forty countries with hundreds of concerts and festivals. CHTHONIC has become the most visible Taiwanese metal band with international publicity. In the past five years, all five members of CHTHONIC have turned a new page in their lives respectively. The frontman Freddy Lim (林昶佐) formed a new political party and also got elected into the Parliament while the others established their families. Nevertheless, they have not forgot the promise to release new material to the fans. 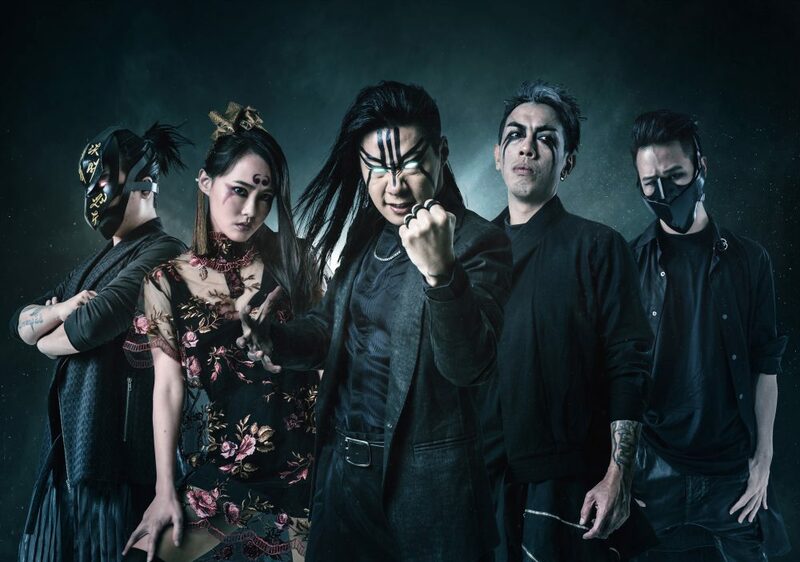 This year, CHTHONIC has Randy Blythe, frontman of Grammy-nominated metal band Lamb of God, and Denise Ho (何韻詩), iconic freedom fighter and singer from Hong Kong, to join the creation of the album, appear in the preview of the title track, and raise huge resonance in the music circle. Secretive promotion planning generates discussion with the title track remixed by other bands and iconic Hong Kong singer Denise Ho. The promotional highlight of the title track in the new album, “Millennia’s Faith Undone” (烏牛欄大護法), has been remixed and published by five bands and artists with their own distinctive styles—Elephant Gym, Hom Shenhao, Unfamiliar Friends Party, Bison Country, and Angry Youth, which raised the speculation and attention among fans and people in music industry about the song and the series of remixes. The speculation even hinted the possibility of renaissance of lyrics in Taiwanese. Days ago, Denise Ho, the iconic Hong Kong singer, published her version of “Millennia’s Faith Undone” as her first Taiwanese song mixed with the voice of Freddy Lim throughout the song, which has become a hit in Taiwan and Hong Kong. As the talks about the relations between the song and CHTHONIC continues, the answer was finally revealed today when a 60-second preview of the original song was published by CHTHONIC. Fans will be able to listen to the full version on September 4th. CHTHONIC’s New Album carries the metaphors on social ideologies and philosophies through depicting Taiwanese gods and deities in search of ideal in blood-shed battlefields with a mythological, religious, exotic atmosphere. According to CHTHONIC, the new album Battlefields of Asura depicts the adventure of deities in Taiwan through eleven songs carrying messages about resistance, freedom, and fraternity. The journey is full of hostility, adversary, impregnable fortresses, and desires, but also inspires infinite courage to search for eternal wisdom. Anyone deeply touched by this album will eventually realize that it is the origin of all thrilling epic stories portrayed in the past albums. This album sounds like gods versus devils and fights among evil spirits on the surface; however, everyone can feel the empathy of fury, grief and even strength of resurgence from the lyrics. When asked why the band names the new album Battlefields of Asura, Doris, the spokesperson of CHTHONIC, states that this album is the prologue of the albums released in the past and was inspired by and dedicated to the activists of Taiwan’s first modern political reform movement back in 1920s. Free Trial MV published today. CHTHONIC’s first album in vinyl along with CD. Pre-Oder of collection set begins in Taiwan, Japan, Singapore and Hong Kong. The first wave of promotion will begin today with a 60-second free trial MV online. CHTHONIC also begins the pre-order of CD and vinyl in the EU and North America. It is also the first vinyl released by CHTHONIC since its formation. Pre-order of album collection set in Taiwan, Japan, Singapore and Hong Kong also begins now. The package includes new album, T-shirt and caps, thematic candle glass, rosary plus 7-inches vinyl collaboration single of CHTHONIC and Denise Ho.